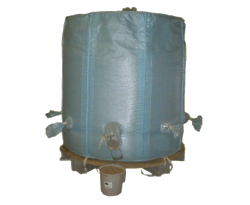 B3 storage sack: 3-ton capacity, can be installed by homeowner, designed for manually filling 5-gallon pails that are then transferred to pellet stove or boiler. 4' x 8' footprint, all-in cost around $750. Pellestore 3TX: The PelleStore 3TX is 72" in diameter and 72" tall (81" tall on an optional plywood and cinder blog stand). 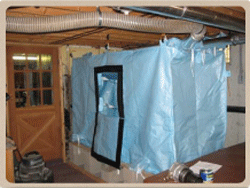 There are sleeves on the top for filling and venting, four sleeves for draining, including one with a gate valve, and a velcroed door at the top for getting the last few pellets. Pricing and functionality much like the B3. 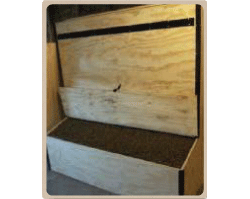 Pellets Express 4000: this steel reinforced plywood box, constructed on-site, holds 2 tons of pellets. Dimensions are 40” deep by 74” wide. Price, including piping for fill and vent, should be around $1000. 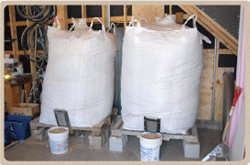 Modified Super Sacks: another low-cost solution designed for garage or basement installation, this system may or may not be feasible for your delivery agent to handle.